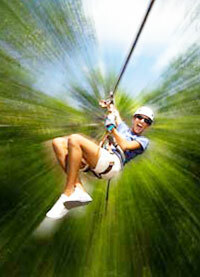 Enjoy a great combo tour from Playa del Carmen with the ultimate Selvatica adventure! This amazing trip includes six different activities all in one exhilarating tour! This is what you can expect from this adventure: zip lines and canopy, traverse aerial suspension bridges, Polaris RZR ride, cenote swim, and of course the extreme parachute jump (optional)! It all starts with a complementary pick up from your hotel, we'll take you to the world-famous Selvatica Canopy Tour, the #1 canopy tour in the region and one of Travel & Leisure's 35 great adventures of the world. Here you'll fly high above the ground on a series of 10 exciting zip lines, even upside down or like Superman! Then get ready to walk in a series of suspension bridges between the treetops, and if you are brave enough you can parachute from a treehouse to your next adventure! Now that you are back in the ground, get ready to start your engine on a Polaris RZR all terrain vehicle and take it for a spin through an exciting obstacle course and jungle trails. After all the adventure you can now relax and have some additional fun, you get to ride a zip line into a freshwater cenote to cool off and enjoy a refreshing swim! When: Three Times Daily, except Sundays, 10:30 AM, 12:00 PM and 1:30 PM. Where: Complimentary Pick-up from your Playa del Carmen hotel or Cruise Ship Pier. How Long: 5 Hours Approximately. Cruise Passengers: Yes! This tour is a great idea for a shore excursion from Calica or Cozumel.